It’s been almost 30 months since the gold bull hit the dizzy heights of $1900/oz back in August 2011, sending many of us into raptures. However, it has been a very different story since then with gold slipping to a low of $1180/oz in June 2013 before bouncing higher to almost touch the $1400/oz level. Fast forward to today and we have gold trading at around $1310/oz level, having tested the June bottom around Christmas time 2013. Many believe that the bottom is now in and the bull has resumed charge, with the bears being exhausted. We would like to agree with them but we are still of the opinion that a challenge to the June lows could still lie ahead of us. Gold prices are presently being dragged in both directions with the geo-political issues in the Ukraine putting upward pressure on gold as it is viewed as a safe haven in terms of protecting ones wealth. Gold is something you can take with you should the need arrive and you have to move to a safer location in a hurry. However, for many of us our need to own gold is based the perennial devaluation of our own countries currency. In the world of paper money it is difficult to think of a country where the government is not actively trying to devalue its own currency via various forms of money printing. This form of monetary policy is a short term fix at best as it does not address the basic problem of competitiveness via increased production and better working methods. This is something that we have to live with as our political leaders prioritize their survival through to the next election, rather than do what is best for the longer term. Firstly, Backwardation in the price of gold is now more persistent than ever which tells us those investors will pay a higher price today in order to take delivery and secure their purchase. To actually pay now and then have to wait months before your gold is dispatched has the inherent risk of it never being dispatched and/or some sort of cash settlement being offered if an order cannot be completed. To be willing to pay more money today for gold than buy it cheaper in a few months’ time suggests a lack of trust in the current system of futures trading. Secondly, the US Dollar has an adverse relationship with gold so when it rallies gold prices tend to fall and when the dollar falls gold tends to rise. We can see on the chart below that the dollar is struggling to hold above the ‘79’ level on the US Dollar Index, however it has been there a number of times over the last year and survived the drop. Should it close for a few days or more below this level we could well see it sold off and drop to around the ‘72’ level in short order. It doesn’t sound like much but it is a fall of almost 10%. Should gold in turn rally by 10% then we would have gold prices standing at $1430/oz. This move up could well be the catalyst that ignites a full scale rally in gold prices. Silver prices are struggling today to hold up above the $20/oz level which irritates us as it does not support gold’s advance. Gold and silver usually move in unison even though silver has many industrial purposes which effectively take supply off the market never to be seen again. Silver is managing to trade above the June lows but without any real conviction. Although gold could go it alone we would be far more comfortable if silver prices would put in a more convincing performance and headed to higher ground. The gold mining sector as represented by the HUI did break down and penetrate the June lows in December 2013, before rallying to around the 250 level. Since then the early 2014 rally has lost some of its traction and formed a sideways consolidation pattern. On occasion the mining sector has been known to lead the precious metals sector to higher ground. This has been difficult of late due to the high costs of mining which in turn puts pressure on any producer’s bottom line, increasing the reluctance of investors to put their hard earned cash at risk. We are still not sure that this bear phase in the gold bull market is over but we feel that it is closer than ever before. 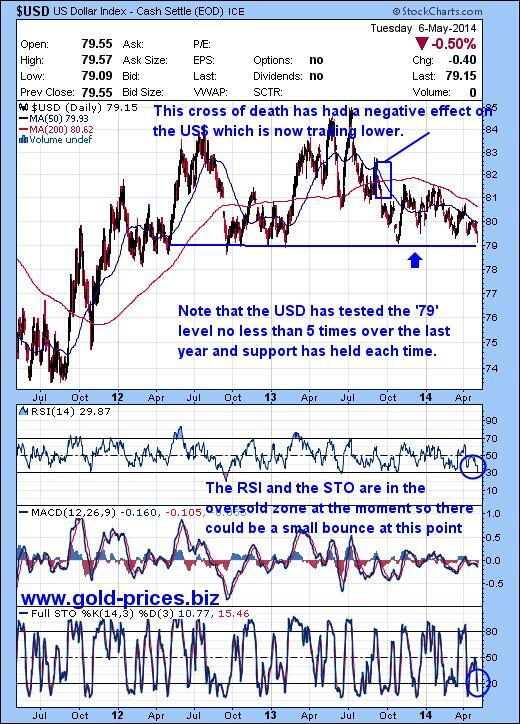 Should the dollar start to plunge then gold prices will increase dramatically. On the other hand should the dollar bounce from current levels and put in a reasonable rally then gold could fall. Given that we entering the summer doldrums for gold it could easily slip far enough to challenge the June 2013 lows of $1180/oz. At the moment its knife edge stuff as it could swing either way. Our strategy is to keep our gun powder dry until we get either a serious spike down or signs that this bear phase has run its course and is now exhausted. We are looking forward with great excitement for this bull to resume its trek north. We have short listed a number of stocks which we expect to rise in multiples of the gold and silver price rise. This list is constantly being honed in an attempt to select only those stocks with the greatest likelihood of success. If you are new to this sector of the market do the work right now as the next month or so could herald changes of such magnitude that it will take your breath away. Disagree? Then please feel free to comment.